I attended 10X Growth Conference in Las Vegas at the Mandalay Bay February 22nd–24th, 2018. It was pretty insane. 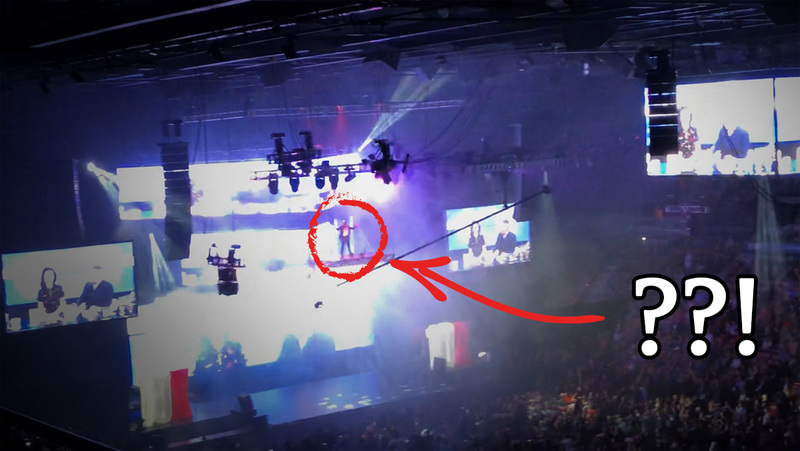 (The event kicked off with Grant Cardone descending from the ceiling on a platform, if that gives you any idea). The event was a firehose of information and insights. I didn’t get to stay for all of Day 3 because I had an early flight out, but I still managed to take over 13,000 words of notes from the speakers on Day 1 and Day 2. I remember things better when I take notes. Actually, I just love writing in general. It’s one of the five most important habits I track. There are so many benefits to it. That’s why I now write over a million words a year (even though I never considered myself a writer). I have a course that will help you build a writing habit in 30 days if you’re interested. 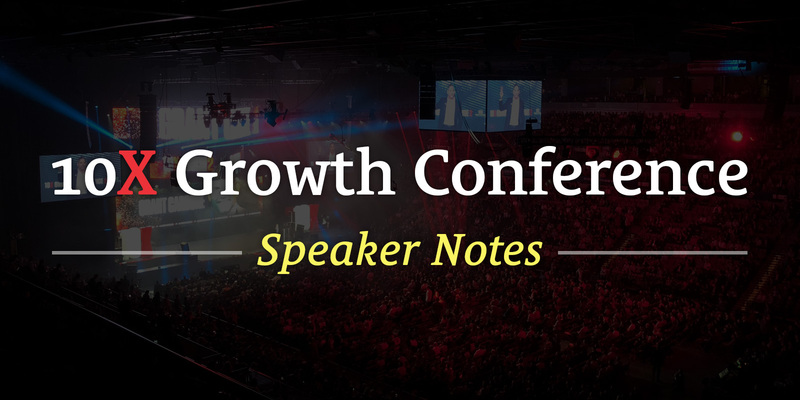 You’ll find all of my speaker notes from 10X Growth Conference 2018 below. If you scroll down, you can see all of it (there’s over 13,000 total words of notes). But I did you one better: I also consolidated everything into one single handy PDF so you can save everything and read it later. I thought you might want something you can download, so I took the time to craft a beautifully-formatted PDF for you. You take too long to get to execution. Make a decision: EXPAND or CONTRACT. 10X is not about adding time, it’s about being unreasonable. You should monetize EVERYTHING that you do (otherwise you’re a charity). The number one reason you will fail is the inability to sell enough products or services at margins high enough. Learn to do that and you can make any dream a reality. There’s nobody pushing you. You can do more. If you know you can do more, you have to do more. If you don’t, you will have this big hole inside. Don’t just dream, dream bigger. My wife gets the sacrifice I make. I am here at this event not for me but for you. Unprogram yourself. Differentiate yourself. Differentiation is innovation. I’m going to focus on the outcome, not the output of the work. Anything is possible. Make a name for yourself. Everything you do in life is affecting the brand called you. Walk, talk, greet, dress, coach, lead. Every time you post: how is this going to affect the brand called me? If it’s not going to improve the brand, don’t post. Clients hire you and come to work for you because they like you, trust you, and are inspired by you. If you live by that credo every single day, and dream bigger, you will have massive accomplishments. I went to college. I was 0/10 trying to get a job in advertising in NYC. I’d save my whole life and had $10,000. I decided to start my own firm. 6 years later I was still sleeping on a sofa. Nothing but a dream. If you are prepared to sacrifice and not look at the calendar, not look at the time, and not look at the date, anything is possible. There is no second place in life. You either win or lose. Do we pay our bills losing? Do we create extreme wealth losing? You do what you have to do to win. Know your customer intrinsically well. Do they drive? Put up a billboard. Social media? GRAB their social media. Get to know them so you are relatable. Set your goals and objectives high. Not at 2 or 3. When you reach 10, you’ll feel poorer than you were at 1. Excuses are lies we tell ourselves to feel better. Our biggest client—we doubled their business. Owner retires. Predecessor comes in and fires us on a Friday. They were 45% of our revenue. Sunday, made a plan. Monday, held executive meeting. 4 months later, I was back with $45M in new business. If you believe, you will achieve. You have to believe in yourself for what could be. 3 months later. 8 got a call from Nissan. They’re still a client now 19 years later. I replaced a $45M loss with $155M in new business. Because I love it. I want to help people. I want them to have bigger dreams. You are getting ready to confront a truly globalized markets. If you’re not a global player, you will not survive the future. Most of you don’t have the intellectual, spiritual, and financial capital (in that order) to do it by yourself. You’re going to be competing against giants who are playing 90 and 100-year game and you’re trying to pay the bills tomorrow. I believe you can build wealth in any market. My whole career is driven by fear. Fear of failure. Fear of feeling like I needed to look older. Study people that are great. Stop studying people who aren’t great. Study a few people. Condensed. Learn from the great people, follow them, and do what they do. I see a lot of people constantly looking over their shoulder. “That’s safe.” I say burn the bridge. There’s no way forward. Dive deep. Did Michelangelo have a work/life balance? Mine and Grant’s version of “commitment” is unlike anyone else’s. For any of you to not walk away from this and be worth $1M in the next 4 years, you are lazy. Kids are trained that they don’t have to wait for anything. Art, music, and business are connected. I start creating and getting ideas, and solving problems. You shouldn’t grow up either. You got serious. You weren’t born to be average. You weren’t born to be mediocre. People respond more to what they feel more than what they hear. What do you make people feel? You’re always making people feel something. The more you become conscious of what you make people feel, the more you’ll change your business, life, etc. The world is trying to get you to conform to average. Every single day has to be a pursuit to get better. You are ultimately chasing the destiny version of you. Typically speaking in business, the highest energy wins. You’ve got to get a little more INTENSE. If you’re going to play the game, play to win. The people speaking on stage aren’t smarter or better than you. You always see the “after”. You don’t see the “before”. When you were little, someone knew you were special. There’s always one. If you’re, blessed, you might have two or three. Who was that? The key to being great in business, is being that person in other people’s lives. KEY: All great business leaders are evangelical about their cause. They spread good messages with everyone. See yourself as a great evangelist for your company. You’re constantly spreading the mission and the crusade. It’s what all great companies do today. Evangelical people rule the world. Be a zealous advocate. Everyone does it differently. Come from a place where you’re on a crusade. A mission. If you get someone’s pocketbook but not their heart, they will leave. Starbucks is a religion; a cult. Apple is a religion; a cult. People will do something more for something they feel like they’re a part of that they will for money. Baptize more people into the church of your business. Steve Jobs was an evangelist. People are drawn to your environment and how you reward them financially. The right people want their work to have meaning. I don’t believe in faking it until you make it. Entrepreneurship is the greatest self-improvement program with a massive compensation package attached to it. Too many people focus on the success of their business and not their own personal development. Your level of success will rarely success your level of personal development. Sometimes you have to Velcro together your dream. You’re not going to get there overnight, but you need to be making progress all of the time. Are the decisions you’re making right now taking you closer or farther? When you meet people, ask yourself: has my life gotten better or worse since meeting this person. Information is free. The separation is WORK. If you get there earlier and leave later, you’re the one who’s going to be separated later. Most of you will eventually sell out. Your will to win can be bought. With enough failure and rejection, your dream can be bought. It’s your resiliency. Ask yourself in advance: what’s the price you’re willing to pay? For me, unless it’s illogical or unethical, you can’t buy me out of my dream. But more people can be bought. The winners in this room decide now, “I’m not for sale. I can’t be bought.” You win with your effort, your spirit, your heart. It’s these little things that separate the people who aren’t average. Stop acting like a poor person. Negotiating the price of everything. Successful people and wealthy people don’t look at the price, they look at what it’s worth. It’s a freeing experience to totally commit. It’s like removing kryptonite from your life. Stop negotiating the price. Stop negotiating the price. Because of your will to win can be bought, you’ve lost. No one will know you lived. You passed through. But no one will remember you passed through. Certain people leave a legacy. I am constantly in a CRISIS to be the next version of myself. The next best me. I’m always going to be in that crisis. The 52-year-old you should be gone forever when you turn 53. Stop letting the world push your family around. You need to push back. Great leaders love, care, and help people. Everyone has a unique gift. Your job as a leader is to identify the gift in people and tell them. Once you have that connection with them, you can hold them accountable. There’s a book being written about your life. Ask yourself a real serious question: “If my life ended right now, as I happy with that book?” Or are the best chapters to come? Most of us would say no. If our lives ended right now, our book would be incomplete. The leading character in your book is you. Far too many of you are obsessed with what Cab Driver #1 and Bouncer #2 think. Stop giving people power who aren’t in your book. Live your life for the lead characters: you, your spouse, your kids. A leading character can decide to live a new script any time she wants. If you don’t change what you’re doing, you won’t change what you’re getting. You have to change. You have to get uncomfortable. Seek discomfort. Everyone wants to be comfortable. Comfort is the wrong target. Be yourself. Be real. Be authentic. Show your team excellence so they can understand your processes, mission, and vision. Train your people. If you’re talking to 100 people, and making $10,000, talk to 200 people. Eventually, you’ll say, “I can’t do more.” Then get better! You need a mentor. You need somebody outside you. Broken nose, overweight, frizzy hair. One of the loneliest kids. I dreamed that I could be in a pageant and win—and I did. If you build a big enough WHY you can do anything. Made my first million at 27. You don’t need someone’s permission to be successful. I hereby grant you permission. The reason you don’t have what you want is because you don’t know what it is. (She brings a 19-year-old young man up on stage). Why do I have to tell a young man what he wants? What just happened? He could have stood up here and told you his dream. He could have told 9,000 people about his idea and asked for a million-dollar investment and he would have got it. He’s going to think about that mistake the rest of his life. Are you tired of not seizing the moments in your life? Fire the arrow first and then you draw the bullseye. He didn’t have a game plan. If you got a moment alone with Grant Cardone for 10 seconds, what would you say? Stop blowing it. Write down right now what you want. You have to believe you’re enough now. I don’t want you suffering any more. Like a good movie, I’m going to start from the end and then go back. Here I am today talking to the most brilliant people. I’m here to tell you that success means absolutely nothing. What you do from here will change not only where you go, but how the world looks at you and how you look at the world. I want to change you from what you are to what you could be. There’s not a single problem in the world that you and I can’t solve. The only reason we stop doing things is because we believe it’s impossible. The minute you stop believing is when something becomes impossible for you. Just you and no one else. There’s nothing that superpowers do today that you and I cannot do. You and everyone one of you who are entrepreneurs are going to become the next superpowers. It makes no difference who the president is. We move the country and humanity forward. The reason I believe that you and I can do that is for the first time, we have the technology at our disposal. You don’t need the billionaires and the money and the finances to achieve the great things we can achieve. My request: I’m going to tell you what my moonshots are, and I want everyone to be thinking about what their moonshot is. Be thinking about what you want that to be. I’m going to tell you about a boy who grew up in India. We were very poor. We didn’t have to be poor. My dad was a construction worker. His job was to build for the government. They pay everyone a little bit of money because they’re going to do it anyway. My dad decided he would be an honest man. And he was very poor. You don’t need so much food. THe way the system works is my dad would tell the contractors to use half sand and half cement in the buildings to save money. In government, you never get fired, you get transferred. We got transferred from village to village. My dad did not care that he was getting paid a tiny sum if it meant he wasn’t taking anything from anyone. My sister went on to become a post-doctorate. My brother went into computer science. I was the least educated of my family. 35 years ago, I came to the United States with $5 in my pocket. Everything I have achieved is because people like you in this room adopted me, gave me what I needed, and gave me the life I wanted. The reason this is the land of opportunity is because I could dream what I dream. I’m going to tell you how I got side tracker. After working for Microsoft and other companies, I eventually started my own company. One day I got tired of making billions for Bill. I started my own company. I didn’t know what I was going to do. The company went on to become worth $35B at its peak. I’ve since left that company and started another company. When I first got here, I lived in a farmhouse with a creek nearby. It was my first experience seeing snow. “God blesses this country with the white stuff!” Until the morning came and there was still white stuff and I had no jacket, boots, and no insulation in the hours. I was living with 6 other guys and making $3/hr. Someone told me to go to Silicon Valley—the land of opportunity. I ended up there for awhile and worked for a lot of startups, and eventually Microsoft. Imagine that a poor person like me can achieve anything in life. There’s nothing you can’t do. The only reason you can’t is because you have a mindset of scarcity. You believe you can’t. You think there’s some value to the things you own. Everything that we value we can make in abundance. But first, I want to talk about moonshots. I decided one day that we as a species are at risk. All of us humans are living on a single spacecraft: the planet Earth. That spacecraft is going into space—a dangerous place. If we get hit by a large asteroid, we’re all going to die. Who is going to make sure we don’t become the dinosaurs? But if people don’t tell you it’s a crazy idea, you’re not thinking big enough. Once you have that crazy idea, how do you go about making that happen? I’m going to tell you exactly how to do that. 16 quadrillion worth of minerals. Fusion. In 10 years, people will want Helium 3. You want to be the guy saying, “I got that.” Go to where the puck will be. End of this year, we will be launching a mission to the moon. When you cross that bridge, burn the bridge behind you—there is no going back. If you keep that bridge intact, you’re tempted to go back. All you can do is keep moving forward. If you are selling something to someone, you are doing a disservice to them. When you sell someone and they buy because you convinced them to buy, they say, “Damn it. They sold me something I didn’t need.” They’ll never do business again. Once you do a moonshot, what do you do for an encore? You do another moonshot. Both are very similar problems: in both cases, people believe the education system is just not working. They believe it’s broken. Same for health care. But it turns out, they’re not broken. They’re doing what they were designed to do. The education system was designed for skills. So that you could use those skills for the rest of your life. But now we live in a technological world where the skill you learn becomes obsolete next year. The education system has to change from teaching skills to helping people learn to learn. In our current education system, collaboration together is seen as cheating. In a workplace, we call it “teamwork”. The reason I want to fix the healthcare system is because I want to stop seeing people sick. What if being sick was a result of choice and not luck? People said that was a crazy idea. Once you make a commitment, amazing things happen. The people around the world will come together to help you because that’s a problem worth solving. People want to do things for their legacy—they want to be significant. I got calls from people all over. Qualified people told me they were going to quit their job to come help me make illness optional. A guy who worked for an organization that developed a biodefense system said he would give us an exclusive license. They spent billions developing it. When you are looking at a problem, don’t look at the symptom of the problem, look at the root of the problem. Human beings fail, entrepreneurs pivot. We all like to win. Why do people who ride Harley Davidsons never ride other bikes? Why do we buy their products? Why does their brand test so well time and again? We know when we drive a Harley Davidson because we want to be a part of it. If that dude drives a Harley, he’s a brother of mine. That’s a human need we all need to have. The employees who show up in your office and you can’t figure out why you can’t get them to be excited, or why you have turnover, it’s because you are not setting the standard. You don’t understand how to systematically create culture. Most of you haven’t even done the work to figure out what you’re about. What you’re about and what your company is about are the exact same thing. You need to understand and put some time investment into figuring out who you are and what you stand for. What do you stand for and what are your core values? I run a $200M company. Every one of the 17 times I went into the bathroom at this conference, there was a paper towel on the floor. I picked it up, and I put it in the trash. I accept the responsibility: if I left the bathroom and left that on the floor, it’s my fault. I know there’s people who clean the bathroom. I don’t care. I know the guy who threw that on the floor is broke. When you’re identifying your core values, can you see how your employees leaving paper towels in the bathroom affects your business? If they don’t pay attention to those personal details, what do you think they’re doing to your customers? It’s not about the company. It’s not about money. It’s about who they are. They get the keys on how to be from you. How do you compete in a crowded space? Do you think Harley Davidson has to compete against the price of Yamaha motorcycles? No. They have differentiated themselves. That’s culture. Everything you sell and everything I sell is a commodity. Everybody says they sell something great. The only thing that’s going to keep someone from buying someone else’s stuff is culture. What’s going to keep employees from leaving every year? Culture. Culture is not setting up a game console or ping pong table or happy hour or a birthday cake. Culture is about what you believe, who you are, what you stand for, the mission you’re on. Step 1: Identify your core values. When I interview people, I send guys to go out and look at their cars to see how dirty it is. Because if their car is dirty, their work will be too. Step 2: Learn to communicate in the language of the core values you set. I take extreme pride in the fact that if you come into my warehouse at any time, it will be clean. It has to be perfectly clean to where you would lick the floor. And I enforce that standard. You know what he’s going to do? He’s going to go get the broom and sweep the floor. If he doesn’t accept responsibility, I fire him. I don’t fire people for being stupid or making mistakes. But I absolutely will fire someone for not understanding and executing on the core values I set for my company. We have a culture where people literally go out and get tattoos of our logo on their skin. Step 3: Set an objective, mission, or enemy of your company. Now your employees will understand that this company has a reason behind it. It’s more important to have a mission than an enemy. Because you’re going to defeat that enemy. Think about what your overall purpose is. Eventually, customers come in alignment with the mission. Being an evangelist is nothing more than outlining the mission or the enemy over, and over, and over again. Your mission doesn’t have to be this holier-than-thou mission. People have to believe in it. This has to come from you. That’s how you create a culture. But I’m leaving something out. Cultures are not accidental. It’s not a mistake. It doesn’t just happen upon a company. When you go to hire people, you MAKE good people. There’s not this well somewhere that has people who believe the same stuff I believe. It’s not a magic thing. It’s me creating them deliberately, and you can do the same. Stop looking at hiring as “Is this guy the right guy?” Start looking at what you can teach them. Start with their core values. Ask them crazy questions in the interview. Ask them about their culture, ask them about what their core values are. We have workouts in the back of our building at 4:00 PM every day. Physical stress bonds people like no other. Everything you do, say, communicate, comes down to your core values—and those values can only come from you. Which means you have to be really honest with yourself. Leading by example is not the best way to lead, it’s the only way to lead. You have to live it, and you have to let them see you live it. You’re not looking at your culture as something that can literally make you millions of dollars. Step 4: Own it when you f— up. People will crucify you if you don’t accept responsibility when you screw up on your core values. Become a clean, controlled killer. Everything you do is trackable. Whenever a customer enjoys our product, they have the ability to spread word of mouth about your product to every person they know—and they do. Guess what they can also do? They can also tell everybody that it sucked. How you won’t answer emails, give them proper service, or how you won’t help them. They can tell everybody and tell them instantly. What do I mean by clean? Very simple: Do the right thing. If your intentions are to do the right thing (even when you don’t do the right thing), people will understand when you take responsibility for it. Always try to satisfy the customer. Don’t just make them happy—make them ecstatic. Go over the top. Act like these people gave you a chance to earn their business and YOU f—ed it up, not them. If you want a culture that insulted you from competition and prices and becomes your most valuable asset, you must ALWAYS do what’s in the best interest of people. You have to be selfless. (Which “being selfless” is one of our core values). Everything you say, everything you do, everything you put out there is done with intention. You are disciplined about what you do. (By the way, “be disciplined” is one of our core values). Your competitors say this, but they don’t do it. That’s where you’re gain loyalty, customers, and dollars bills when you do it. Create a list of five critical tasks that need to be done today that will put you in a better spot tomorrow. If you’re struggling with your weight, two of those will be: work out for at least 40 minutes today, and eat nutritious. If you’re already training, don’t put it on your power list. It only goes on your power list until it’s a habit. Your beliefs dictate your outcome. This is the biggest thing you lack. I believe in helping people. I will give you the shirt off my back. I will pay your bills. But if you’re competing against me, I will rip your throat out to win. I will stomp your face. I don’t believe in giving everyone a trophy. I believe in winning. If you think someone’s going to feel sorry for you, you shouldn’t be in business. You’re going to run up against someone like me, and they’re going to crush you. This doesn’t mean you have to be an a—hole, but some of you need to decide if you’re willing to do whatever it takes to win. When you win, your employees win. They won’t go to battle for you if they don’t believe you’ll do whatever it takes to build your business, grow your business, and further their careers. They will never buy into your culture. If you don’t have the taste for blood or the will to kill people to get your way—and I don’t mean shoot them, I mean pressure in the business world—if you don’t have that within you, you have no chance to win in business. Steve Jobs wasn’t an a—hole. He just wanted to win. If you’re not that way, you better learn to be that way. When people buy into your culture and core values, it doesn’t matter what your competitors do—what they come out with or what their price is. It’s the ultimate weapon when it comes to winning. There’s nothing you can do that will defeat a strong culture. It’s impossible. If you’re looking to build a brand and make your company impenetrable, you’ll become an expert on this. Do you need to have written a book to a book? No. But most of you think you need a book to sell a book. Present a product that solves a problem today. Where is your cycle breaking down? I have good products. I have good services. I don’t need to wait. Take your cycle and condense it. The old ways of “build rapport” first existed before the internet. The internet is not going to make sales go away. Ed: Every single person is in the sales business. Most people are confused with intent. 100% of the time, Grant knows his intent. Grant: You’ve got to get the attention, keep the attention—keep them in the chair. Ed: You’ve got to be willing to get to that close and to be intentional all of that time. Are you really willing to get to that close? It’s a culture that’s led by the leader. Maybe you close in such a way that’s not transferable. The way Grant teaches the process has my full endorsement. Grant: Whoever gets answers to the questions controls the sale. You guys just add a lot of time. How do you know that they didn’t already go online and find what they need? Ed: We all can get more intentional with our closing. Your intent to close people—even on closing them to refer people to you—this is one of the most misunderstood thing in the world. The ability to speak on stage is the ability to close. We all overestimate—you need to go back and revisit it. Grant: We reward people in our office for first time close. We pound. We’ve got a guy, Bonnet, who did $1M last year. Bonnet—what tip would you give? Bonnet: What my boss (Grant) taught me is that you have to be frequent before you get great. Teach your sales team that it’s not about selling products or industry specifics: it’s about showing up every single day and putting in the work. If you’re not willing to do that in your industry, you’ve got to get out the door. Grant: What most salespeople do is if there’s an objection, they get out of the close and go back to presenting the product and selling. Ed: There’s a thing that starts to happen with the “frequency” thing. People in the military will get shot and killed because they won’t fire their weapon (since they don’t believe they can hit the target). You’ve got to drop that belief and get frequent. Grant: But you think that if you ask, it would be offensive to people and you’d lose them. You’re so “professional”, you’d never make a phone call! You guys need a lot of different products. Ed: Early in my career, I was a crazy closer guy, Later in my career, I got more patient. The reason Grant is unemotional about how you feel about it is because he’s so emotional about what he knows it can do for you. I don’t get your weak objections because I believe so strongly. Grant: The reason you’re getting those objections is because those are YOUR objections. Ed: This works. The people you know who are polite are broke. We’re intense because this stuff works. Grant: You guys don’t go for the close because you think you’ll offend them. There’s no one thing you can say to a person that will cause them to not do business with you. There’s never one thing. Ever. Ed: Write down the top 3 or 4 objection you get—you’re manifesting those. Either you’re not the decision maker, or you don’t think it’ll work. Then you’re not the decision maker. Even if he is the decision maker, he may not make a decision today. Ed: Did you get this way out of necessity or failure? Grant: I was selling cars and I hated it. I hated the way they were telling me how to do it. 12 steps. Even alcoholics don’t want to do 12 steps. I want to sell them a car. I want to get the commission. Just ask for the money. Ed: Most of my biggest clients, I got them way earlier in the closing cycle than I thought I would. The best people want you to hurry the hell up and take the money. The longer you pitter patter around, the more you decrease your chance. Your threshold for what you think they need for you to close is much larger in your mind than what it really is. I put $600,000 in Grant’s fund when there was no property in it. Grant: There was no sales pitch. Ed: There was no sales pitch. You guys who have unbelievable collateral and reputation in the market: you have the right to ask sooner. You guys don’t ask these questions. I can ask whatever I want. I want you to ask someone (a random person) how much money they made last year—and get an answer! Ed: By the way, according to most studies, you’ll get an answer from most people. Ed: But now you’re in a conversation. Grant: You can’t get great until you get frequent. Ed: All of the people I know who are successful are better closers. Grant: This cycle: start looking at where you can take out the fat. What’s your offer? How soon can you ask? Ed: Role play makes you reflexive under pressure. Grant: After 24 hours without practice, I get rusty. Would you agree? Grant: Have a bunch of problems. Don’t let money be one of them. Every morning in our morning meeting, we share successes people have had with our program. We have an entire department where their sole job is making sure people have success in our programs. They are required to bring it up every day in the morning. It’s great for our staff because it reminds them and reinforces to them what we’re all about. One of the biggest mistakes we made in our office was waiting too long to invest in advertising and marketing. Sales and marketing tend to be at odds with each other. We wanted to make sure that you have the complete cycle—the business marketing piece and the sales piece. How many of you have been following Grant for more than 4 years? How many of you have been following Grant within the past 2 years. That’s the power of advertising and marketing. Four years ago, we spent $7,500/mo in advertising. Leads that don’t get converted come from ads that aren’t good. We’ve hand selected some of the top experts in the work who are using some cutting-edge strategies to grow their businesses. You don’t have to have a huge ad budget and website in order to grow your business and brand. Today, we’re digging into leads, advertising, marketing, and eCommerce, and we’re doing that with some of the best. Click Funnels. $100M/yr. 55,000 customers in 3 years. Sold hundreds of thousands of books. It was believed that humans couldn’t break the 4-minute mile—until it was done in 1965. 46 days later, someone else did it too. It wasn’t until one person did it that everyone else thought it was possible. “If this guy could make $1M in a day, I wonder if I could make $1M in a year.” That was my goal. I started January 1st, 2005. In 12 months, I got close, but didn’t hit it. I tried again in 2006, and I didn’t make it again. The next year, January 2007, and by October 16th, I crossed the million dollar mark in a calendar year. Because someone else did it, I knew I could do it. Since then, I’ve had million dollar years, million dollar months, and million dollar days. In March 2017, we officially launched “The Two Comma Club”. We had 93 people last year. Since then—at our event, there were a lot of people in the room who saw and were inspired—we now have a new person every single day who is making a million dollars a year. What we’re launching next: Two Comma Club ‘X’ – $10 Million Dollars Inside Of a ClickFunnels Sales Funnel. We have 15 people so far. The 4-minute mile has been broken. The vehicle your business needs to have to break the million dollar mark in the next 12 months is a funnel. There is not a company in this room that we couldn’t 10X in the next 12 months with the right funnel. What does going small in mean? You are literally one funnel away from 10Xing your company. Sales funnels are the key to growing all of our companies. The traditional website—I call it the “anti-sales” department. It’s like having a salesperson who hands someone a brochure, stands back, and hopes they make a purchase. You would fire a salesperson who was hiding! A sales funnel is like taking the very best salesperson you have, cloning them, and then taking every person who comes in to find something they need and growing their success. I discovered the HARD WAY, but I want to help you cheat and do it the easy way. Took two months to build. We’re going to build a funnel in 10 minutes. Those who have figured this secret out are called funnel hackers. Secret #1: Whoever can spend the most money to acquire a customer wins. Secret #2: How to get the best sales person on planet earth to close sales for your product 24/7 (without ever complaining, asking for a raise, or taking a break). Secret #3: How to get all of the customers who are going to your competitors to come to you instead. You have to make a customer worth more to your business than any of your competitors. We were able to beat both of them in 3 years without taking on any capital. We now have investors, but not in the beginning. We run ads, and we drive people to a sales funnel. On average, I run $20 in ads to sell one copy of my book (which we have free shipping on), and I make about $40 (through upsells and other offers). I then offer them to try ClickFunnels for free. When you have a funnel, you can instantly outspend your competitors and ethically steal all potential customers in your market. What funnel should I use? It depends on the kind of business you have. No matter what business you’re in, there’s a funnel for that. How do you figure out what kind of funnel to build? Through a fun step we call “Funnel Hacking”. You don’t have to be sales funnel geniuses. All you have to do is look around in your industry, find someone who is successful, and model it. In this industry, you don’t want to be a pioneer. I found someone selling $100k/mo selling supplements. I thought about modeling them. But what I didn’t know is whether or not they had a lot of arrows in their back. We launched a replica and in a very short amount of time, we were making $20k/mo. Which was cool, but I figured there must be something they’re doing I’m not. Something I’m missing. So I did what any good entrepreneurs does and pulled out my wallet and bought their product. I found another guy making $300k/mo selling a supplement. They were doing things a bit different. Pulled out my wallet and bought their product. My total investment to get over $1M of “funnel hacks” from my competitors? $100. I just bought their product. What’s cool is this happened a while ago. Before they implemented, they were doing $1M/yr. With a year, we didn’t just 10X it, we 20X’d it: they’re doing $20M/yr now. You are one funnel away from 10Xing your business. Where do you find a good funnel? And how do you know how much money they’re making? Go to ClickBank.com. They have over 100,000 successful funnels. The best person to sell your product is probably YOU. There’s no one who believes in your product more than you do. I went from having 60 full times sales people in one office to replacing them with one sales funnel. I helped Tony Robbins sell his book, Money. So we rented out a hotel suite and recorded 3 videos. Those three videos will sell his book forever. What do you have for this person? You can sell anything by answering these 4 questions. Now that you have the videos to sell your thing, you need to plug them into the funnel. How do you get the traffic and the leads? How do you get people from competitors to come to your funnels instead? Where are they getting their traffic? At this point, we know where their traffic comes from as well as what their messaging is (what’s on the page). Do the same things they’re doing. Buy ads on the same websites. If you modeled what works… do you think that if they’re having success, you’ll have success as well? Maybe you still think you couldn’t get the same results. Maybe you totally screw it up. Maybe you only make $10k a day instead of $100k a day. How bad is that? Grant: Today’s marketing day. What’s your advice for all of the people who come on Shark Tank? Daymond: Don’t go out there and tell everyone how great you are. You have to SHOW them how great you are. You want to create community. Once you create community, they talk whether you’re there or not. They’ll converse about you even when you’re not there (your brand, product, concepts, etc.). Grant: What’s the transition from selling hats on the corner 25 years ago to the brand that Daymond John is now? Daymond: That Daymond still influences everything. I believed in quality, community, being strong and independent. As I sold hats on the corner, I got better and learned what the community wanted from me. I sold hats on the corner when the Apollo Theater let open at midnight. When they gave me feedback, I went back and improved the product. The Daymond John does it today with my personal brand. I still describe myself in 2 to 5 words. Daymond John is: I’m on a quest. Daymond: I’m wearing that because I have my 25th anniversary shoe collaboration with Puma. A lot of you see me on Shark Tank thinking I just roll out of bed with a three-piece suit, but I had to hustle and struggle to 10X myself. I had to go to conferences to improve myself. I’m wearing Puma today because everyone expects me to come out in a three-piece suit. Grant: Tell us the story about the studs (diamond earrings). Daymond: Here’s the story: I go to shoot some show that I thought at the time was going to be crappy (it was called “Shark Tank”). I thought nobody cared about that stuff. I go to LA and I want to pitch Mark my three ideas that I thought were better than Shark Tank. He knocked them all down. I go to the shoot, 11 years ago, and I have my earrings on—expecting to go to the club later. But they end up going to the pilot and they said I have to keep my studs in because they can’t have one shot with me wearing them and another without. Grant: It’s a branding thing. Daymond: Yeah. It’s about continuity in your behavior, your brand, etc. The diligence starts when I look up your name before I even meet you. Are the 2 to 5 words there? It’s all about the people you surround yourself with. You’re here today around a ton of likeminded people—how are you going to take that and apply it throughout the rest of the year? I keep a lot of millennials around because it’s not just about older teaching younger. God gave me the ability to share with everyone else my success and how I got there without knowing anything. That’s how I celebrate my birthday (today): by giving. I know you’ll go off and educate your family. Whether it’s Shark Tank, my Facebook, or giving away my books. You have to be extremely selfish to be successful. You have to be selfish for yourself. Michael Jordan didn’t go to everyone’s else’s practice, he went to HIS practice. What I learned by studying these 15 amazing people is that they all have different techniques to solve the same problem. Most will not answer email for the first hour of the day—because if you answer email in the first hour of the day, you’re taking care of everyone else’s problems. Many won’t go onto Instagram in the first hour of the day because everyone on there is richer, healthier, skinnier than you. Don’t start your day thinking about how great everything else is. I made 50 calls every single day for 4 or 5 years and you can’t believe how that started to compound. Grant: What’s the response been to the book? Daymond: #1 Wall Street Journal. Hundreds coming out to my book signing, but more importantly, people realizing how they can change their life with small adjustments. If you could write your obituary today, is that how you would want to leave this planet? You and I schedule time with our families. People don’t do that because they think it’s insensitive, but you’ll do it for a call, a train, etc. Eventually, your kids, your wife, your mom aren’t going to be around anymore because you didn’t make time for them. Dads, take your 19-year-old daughter on a date. Daymond: You won’t see this stuff on Shark Tank. What made Shark Tank so effective and so powerful is the fact that when I was growing up, no one knew what a millionaire or billionaire would ask you when you came into the room. I went bankrupt a couple of times by giving my money to people who were lying to me. Until I did the work and educated myself on how to look at the money. I think your relationships matter. Life is about intimacy, connection, and communities of people. You’re going to get a lot of stuff at 10X Growth Conference 2018, but one of the most important things you can get from an event like this is a relationship with a human being. Every increase in my business, I can tie back to a relationship I made at an event. My name is Ezra, I’m an eCommerce expert. eCommerce is my craft. I’m very good at it. I started out broke. Wearing hand-me-down clothes, being ashamed of the car I got picked up in. I was able to leverage the power of digital marketing and the internet and build a business that was very successful. I consult for a lot of the Shark Tank brands on their eCommerce. I consult with people who buy multi-hundred million startups. In 2017, my brands made $26.1M. I’d like to show you my system for selling. The story of ‘Johnny Howya Doin’. I used to play poker for a living. I moved to NYC when I was 17 to play poker for a living. I was pretty good at it. I got invited to a lot of big games. Back then, it was underground clubs and mafia, and they called me ‘Johnny Howya Doin’. The reason I tell you this story is that my viewpoint is that timing is very important in life. If you want something, find someone who has what you want and get it from them. A poker guy I read said, “Wait until everyone’s been playing for awhile and then show up.” I waited until 1:00 AM or 2:00 AM to show up and play because it was after everyone else was drunk. My company, BOOM! By Cindy Joseph makes $20M/yr. Our brand, which is geared towards women over 50, has a PRO age message. It celebrates who you are now. It was the right time for this message in the market. My great grandfather lived in Russia. He’d take cotton and who’ll, put them in a horse-carried wagon, travel 7 days in a wagon with his 3 kids to Vienna, where he’d trade it for leather. His son had a clothing store. Came over to America on the lower east side of NYC. He’d buy stuff from someone in midtown, have them sewn by another guy—this was in the 60s. Back then, you could get a fully tailored women’s blouse for $3. It was goin’ down on Orchard St. back in the day. My dad and I would sell things at flea markets. I do the same thing as my family, just online. We are the first people in humanity to have instant access to everyone else via the internet. 4% of all transactions in Q1 of 2010 in America were happening on the internet. 96% of transactions were not happening on the internet. Q3 of 2016: it was 8%. Millennial generation: they don’t have the same fear of technology that Gen X, Gen Y, and Baby Boomers have. Where we’re headed: it’s going to double again by 2021. Everyone thinks they missed the boat, but more boats keep coming. First, it was Google AdWords, then it was Facebook, Instagram, now Pinterest. How do the big boys make it? Firstly, they have something good to sell—something people actually want. You believe in the thing you’re selling. You have that part handled. Next, they usually have 1 visibility source that is consistent. If you want to have consistency and scalability, you need to be able to turn advertising into profit. Ads are the fuel that drives your car. The more you invest, the more visibility you get. And if you build a sales process like I’m going to show you, you’ll be successful with it. Old advertising was all query based (search, find, buy). This is why you need a story! You can’t just say, “Buy this thing!” you must engage someone in conversation. Tell a story that is relevant to their life. Solve a vital problem. A group of people who are having a collective experience. In my experience, women over 50 going through an aging process where everyone is telling them that’s bad. Collective experience + multiple communication mediums. We’re communicating with people in a. bunch of different places. You need a story you can tell about your brand and your offer that you can put in front of people. The way people consuming the digital medium dictates HOW you should tell your story. How are people engaging with stories? People are consuming in shorter amounts of time but more frequently. 33% of people who show interest on mobile buy on their desktop. 67% of consumers start shopping on one device and finish on another. People are moving to bigger devices to make purchases. The average person has 194+ channels they consume from. Facebook and Instagram account for more time spent on mobile than the next 10 platforms COMBINED. They have the lion’s share of the visibility. It means Facebook + Instagram are your visibility sources. At the end of the day, I believe it’s your responsibility to sell as much as you can. It creates a surplus of money—and that money can be directed to causes that you find noble. It also means: you’re going to need multiple touch points before you make a sale. Big Idea: Your core platform—and any sales funnel you create, is simply a collection of conversion assets working in concert. What is a conversion asset? A video, testimonial, email, sales page, etc. What is the best conversion asset to sell? We can purchase visibility for whatever it is we’re selling. Give someone a story. 100 million hours of video per day is watched on Facebook. Video has 1200% more shares than text and image combined. Video ads have an average CTR of 1.84% which is the highest of all digital ad formats. A native video ad is the perfect top-of-funnel conversion asset. Use customer testimonials: obviously, you think you’re great, but if you have other people saying you’re great, that’s very effective. What should be in your video? The blue underlined text link gives someone a way to get to your offer without someone having to watch the entire video. The main thing your video must do is demonstrate ownership benefit. I like to put a caption at the onset. Something to catch their eye. If you can make people laugh and also demonstrate the solution to a problem they face, that = GOLD. People will say you have to blog, create content… I would prefer to run an ad to people I know have a problem, and show them a video with a story that relates to them. That is great for generating awareness. The success of your advertising hinges on your targeting. Stack interests on top of one another. We’ve found that iPads when people are connected to wifi are 10X more profitable. iPads seem to be where people purchase stuff. Start there. Start with a narrow group of people so you have a greater chance of success so you can make some money and then go wider. Use square video. Square videos take up 78% more space on mobile. They have a 128% better completion rate on mobile. Retargeting tablet and desktop. GOLD tip if you’re not spending a lot. Okay, so you have a video and a target to sell, now what? What made the difference? Offer pages. Your business hinges on your ability to implement high converting offer pages. If you send people to a poorly converting offer page, you’re in trouble. It’s literally the same content! Some people like to watch, some look, some read. You’ll have every format above the fold. It’s why when you Google something, they’ll show you image text, and video results. Repetition creates mastery. If you put your attention on this stuff, you’re going to get better at it. It takes simply the willingness to put your attention in one area over time. The number one skill a human being can have is mastery. Mastery is the willingness to put your attention in one area over time. I became a good poker player by doing it all of the time. I became a good marketer by doing it all of the time. It’s not about how much you work, it’s about what you produce. That’s how you build a real business. Sales is nothing more than getting some leads and selling them something. Without ever opening your mouth. A lot of people forget this step. The people with cash in hand, wallet out. I want the second group. The purpose of the introduction is to convince someone to engage with you. Get their commitment to stay in place. Convince people to engage. Get them to stay on the page just long enough. Build a system that is based on micro commitments. This is one of the most misunderstood steps. Most people think when you tell a story, it’s about YOU. Connect with people, build a relationship, connect at their level. Let them hear the story of the product, not you. I lifted up my system—not me. A 2-minute selfie video allows me to connect with people. That’s all I need to do. If you go above and beyond that, you’re ruining it. Build your value and credibility. Don’t build credibility first—build it in the second or third stage. The way you build your credibility is by showing someone you have value. If you do a good job in Steps 1–3, people start to like you. They start to favor you. Confirm the commitment they’ve already made. My ask is simple so I don’t need to oversell it. Before you buy traffic, you need to nail down your 2 pages. Within minutes, you can access 1.7 billion people. But it was expensive. And it cost a lot to figure things out. You have to follow up. Your hottest leads are in your hands—in your system. You’re chasing leads when you have 7-figures worth of leads in your hands. Automate the nurture by getting people in a database. We sell $20,000 to $30,000 packages with automation. Who are you? What’s your story? What’s your mission? I’m not a speaker, I’m not a TV personality. I’m a coach—an entrepreneur. How do you do that? How do you act tomorrow in order to be evangelical? That’s what I do! That’s what I teach. When you start talking about what matters to you more than anything else, you get evangelical. I put people on a MISSION. As a coach, I’m not motivating you. I don’t want motivation, I want education. Everything I’m going to say is worth a lot of money. I want to tell you what you need to say and how you need to say it. I’ve helped Grant share his story. If Grant ran for office—I’m not saying president, but office—it would be the biggest leap in terms of getting people to know him. I know he doesn’t want to do it. But that is the way. We do have a TV reality star in the White House. It doesn’t matter what you like—you have to start caring about what the audience likes. Find the vein diagram overlap of where your passion and energy lie. I’m going to tell you how to access it. I took that pain and married it to my client’s pain. You have to marry your pain to your client’s pain. It doesn’t have to be dark and deep, but it has to be something that gives you passion. It’s just pattern recognition for me. I’ve coached thousands of people from Barbara Walters to Grant Cardone. You have a personal pain that you have to be willing to access and talk about. Your story has to be well crafted. You have to have a story worth telling. Guess where that comes from? Find that pain point and tie a thin thread to your customers pain. That’s what a brand is. When you solve a customers problem and your product works for somebody, the most powerful version of that story has to come from you. That’s what the media requires. The reason Grant is so big is because he’s wiling to tell the story of how he came up. Grant came up hard; he came up broke. That’s what he knows and what he feels. He will not allow that to happen to you. “The middle class is doomed.” He’s trying to save you. I coach people through the process of finding where their personal pain overlaps with what their customers are experiencing and how to tell that story in meaningful, powerful ways. Do you care about what you’re selling? Now you’re ready to build a brand. You’ve got to care first. Once you care, you’ve got to fight. Social media, the media, your clients—everyone needs to see and feel you fighting. I care because my dad told me it wasn’t possible. Take that pain and turn it into power. Just press record. Try it! Yeah. Because I got you to do the thing you were scared to do. I don’t like doing it either. I’m my own worst client. I’m not famous because I don’t want to be—I’m not well known because I’m scared. But I have to. You have to. You’ve got to fight You’ve got to push through the pain that it causes you to think about those things that make you vulnerable. I don’t buy products from somebody I don’t know, like, and trust. There are too many exact same brands. You’ve got to come on video. Fight #1: Those closest to you. My dad f—-ed me up. The only way to get past it is to share your problems publicly. You’ve only got a problem and a fear because you’re holding it in. The dent my dad put in me—that’s why I’m here telling you to push through, be heard, and not be afraid of people. I was told for a long time: I’m not good enough, I’m not smart enough… but you don’t have enough time to hear about my pain. Fight #2: The environment. The industry. I had to fight to get inside the entertainment industry. I fought to understand every aspect of entertainment industry and telling stories. I’ve created more networks than any other human. Grant is successful as he is because he does a daily live show on GC TV. Because he’s doing daily live content, it skyrocketed his career. He’s a workhorse. You know you have to work hard, but Grant is showing up to deliver you content every day. That’s a lot! You better start thinking about how to want to do that. People stop because they don’t know what to do. I was 32 years old. I didn’t stop reacting to life until I was 32. I’ve got to work toward something larger—that’s called a goal—and working on my limited beliefs and my actions. Press record. Talk about it. Tell everyone about what you’re going through. That’s the only way to clear it. I didn’t intend to be in self-help. I didn’t intend to be a motivational speaker. I’m going to change your life! I’m going to get you laid! Everybody is that way. That pain stands in your way. You’ve got to work on yourself. When you start to help other people, you start to see the flaws in you. When you talk about it and access your pain, that’s a brand. That’s Grant Cardone. A global, unstoppable brand. If you don’t access it, you don’t exist. Once you start connecting with people, you will change, your brand will change, what you talk about will change, your life will change. Get on camera. Share and talk about it. Stop being scared. I have come up with a way to get you past these fears. Course: 15 Seconds To Fame. In Instagram stories, you have 15 seconds to make a video. In that 15 seconds, you have your reps. Repetition. Get on Instagram stories and start to—in 15-second chunks—transform yourself. I have a free course that gives you everything you need to know to go on Instagram 15 seconds every day and practice your fame. Text FAME 66866 to get “15 Seconds To Fame”. Start to look into that camera and care about other people. If you don’t, you don’t have a brand, and if you don’t have a brand, you don’t have a business. Press record. 15 seconds at a time. It will change your life.